Ms. Bellouny has more than 30 years of experience in the title industry. 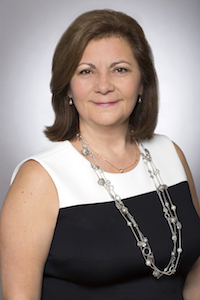 Immediately prior to joining Kensington Vanguard National Land Services, LLC, Ms. Bellouny was Vice President and Senior Underwriting Counsel of Title Associates, a subsidiary of Stewart Title Insurance Company where she underwrote major New York City commercial transactions. From 2000 to 2011 Ms. Bellouny was Senior Vice President and Senior Underwriting Counsel of Fidelity National Title Insurance Company underwriting mayor New York City commercial and multi-site national closings. Ms. Bellouny has served as underwriting counsel at TitleServ NY, First American Title Insurance Company and LTIC Assoc., Inc. underwriting both New York commercial and multi-site national transactions. Ms. Bellouny has lectured for the New York State Bar Association, New York State Land Title Association, New York City Bar Association and to major firms on topics relating to destressed real estate and securitized transactions, Construction Loans and the New York Lien Law, condominiums and title insurance. Ms. Bellouny has served on the Legislative and Law Committees of the New York State Land Title Association and as chairperson of the Forms Committee of the Title Insurance Rate Service Association, Inc.
Ms. Bellouny is a member of the New York Bar admitted in March 1981 and is a member of the American Bar Association, the New York State Bar Association and the New York City Bar Association. She received her Juris Doctor from Brooklyn Law School.